When I first decided to write high fantasy set in my own world of Mithgar, I knew that I would include Elves and Dwarves and High Kings and brave warriors and Wizards and Rucks and Trolls and Gargons and other beings fair and foul in tales set in hazardous times. And surely Elves and Dwarves and nobility and warriors of renown and other such heroes were and are needed in a high fantasy — at least in my version thereof — and I knew they were extraordinary and quite remarkable folks who would step forward to deal with whatever perils might threaten the world . . . and as such would play great and noble roles in any adventure I would write. Yet, I also believed I needed a folk to be a key part of a story who weren't great warriors or High Kings or noble Elves or resolute Dwarves, but rather those who could represent everyman, everywoman, everyperson ; I needed someone with doubts and weaknesses and lack of lore, someone like me , someone with whom the reader could identify, yet also be someone with heart and grit and determination (as I believe we all have within us). I could have chosen any number of folk to represent us, but I also felt, in addition to those named above, that a mythical, high-fantasy land needed some kind(s) of wee folk as well. Oh, I knew that ultimately I wanted to write about Pysks and other Hidden Ones — all more or less Fairy Folk — but I needed a less mystical people to represent you and me, someone less fey to represent us all. Some kind of wee folk, I believed, could in fact fulfill that need. But, to represent us, unlike the wee folk of other authors, of other tales, I wanted that someone to be able, when pressed, to do whatever was needed in the defense of all he or she holds dear. Hence, the Warrows of The Iron Tower and The Silver Call and other Mithgarian sagas were born. And in many instances throughout the tales, driven by circumstance and peril and need, the naïve Warrows — our surrogates, our everypersons — become the most effective warriors, the most lethal killers, of all, even though they never seem to lose their innocence. After all, the quintessence of Warrows is the same as our own — you and me and Joe down the street and Martha and Giles and whoever else you'd like to name; at core, we ourselves are Warrows . . . with our weaknesses and naïveté and doubts and strengths . . . but most especially our heart . Hence, given the foregoing, unlike hobbits and kender and other such wee folk, Warrows are quite deadly, quite lethal when pressed, just as we ourselves could be in the same circumstances. Oh, don't take me wrong: I love the wee folk of other authors' tales, especially the hobbits of J.R.R.Tolkien's magnificent saga, The Lord of the Rings; and let me acknowledge here and now that a couple of things within The Iron Tower (and The Silver Call ) are written in homage, in tribute, to Tolkien . . . in particular, the title(s) of the opening chapter(s), as well as parts of the journey(s) through the Dwarvenholt of Kraggen-cor, of Drimmendeeve, of the Black Hole. Wonderful tale tellers like Tolkien come along not once in a generation, but rather once in a lifetime, and then only if we are lucky. Fortunate are we that he set his story down in writing; fortunate are we also that his work lives on after he himself is gone. Like other authors, I can but pray that my own efforts will live on after me, though when I began I never expected such. 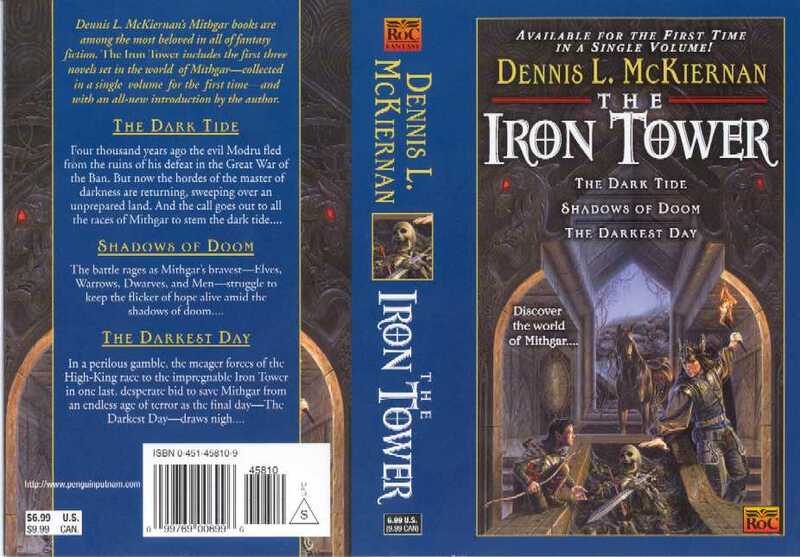 Little did I know some twenty-odd years ago that The Iron Tower would transform my life forever, would lead to a career change and to an age-spanning series. For me, Mithgar is a wonderful place — even though quite perilous at times — and I am so glad to have journeyed therein. Glad, too, am I that so many of you — new readers and old alike — have chosen to travel across Mithgar at my side. A simple thank you doesn't seem nearly enough to express my gratitude for your company, yet it will have to do, for I can think of nothing else to say that would better convey my heartfelt appreciation. Let me also say that when I first penned The Iron Tower , I wrote it as a single story. It was my editor at the time who decided it should be a trilogy (trilogies were a big thing back then). And so it was done that way: three books to tell the tale. But you know, I always felt that the story should have been published as written — as a single book and not three. Well, here we are finally: The Iron Tower all in one book: whole at last. And with this tale now in print as it was written, as it was meant to be read, let us all get comfortable in our favorite rooms, in our favorite chairs or lounges or beds, in whatever and wherever are our favorite places to read, and open the pages to the (oh-so-familiar, for some of us) opening words and experience all over again the tale for the very first time. Do you ever yearn for a particular kind of story and simply can't come by it? Perchance you read one once, and keep looking for another like it, but it just isn't to be found. And so, every now and again, it may be that you re-read the only one you have, and keep wishing for . . . more. 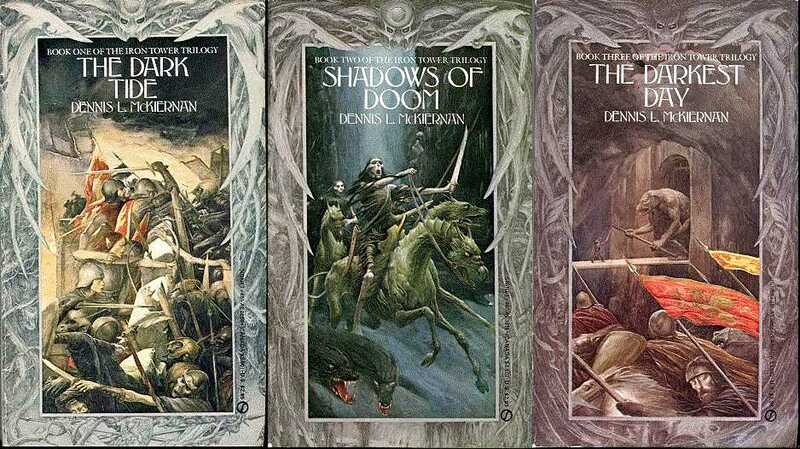 For me, there are many stories or series of tales like that, written by fine authors: Joy Chant, Ursula LeGuin, J. R. R. Tolkien, Patricia McKillip, Katherine Kurtz, to name a few of my favorites. And when a new work of theirs shows up on the shelves, I can't wait to get my hands on it to devour it whole cloth. Unfortunately, some of my favorite writers — such as Tolkien — have sailed upon the Darkling Sea, and no more will new gramaryes with those particular spellbinders' special enchantments come our way. Yet, the type of tale that captures my heart and soul is hard to come by — not as rare as unicorns, perhaps, but still uncommon. And it's a long sigh between. My unoccupied hands keep straying among the special books on my shelf, fumbling for one that perhaps, by some miracle, I've overlooked. And I haunt the book stores, seeking new tales, or sequels, or prequels. Yet they seldom come, and I am often disappointed. For years I have followed that pattern — and still do — questing for the works of others. But those quests only occasionally bear the rare, sweet fruit. In 1981 I thought to try my hand at this alchemy, to tell a tale of my own choosing, and this is it. Oh, I don't believe I've matched the magnificent prose of the others, my favorites, for their glamours are their own, and unique; yet I have told the tale I set out to tell, and perhaps the spell I cast will bind you. Make no mistake, this book is written for those who love the Realms of Chant, the Deryni of Kurtz, McKillip's Riddles, Middle-earth of Tolkien, LeGuin's Earthsea, and the kingdoms, peoples, and special wizardry of the many others whom I've not mentioned, but whose spells exist nonetheless. And if you don't like their magical worlds, chances are you won't like The Iron Tower either — but then again I could be wrong. On the other hand, if you enjoy a high Quest, and the Wizards, Harpers, Dragons, Hobbits, Riddlemasters, Enchantresses, and all the rest that goes with it, then odds are you'll find you like the story of Tuck and Danner and Patrel and Merrilee, the Warrows of this tale.